My sister-in-law's mom, Ruth, died not long ago. She had been ill for some time and required 24/7 healthcare. She spent the last week of her life calling old friends and writing thank-you notes to those who had cared for her over the last several years. It seems to me that she died the way she lived – counting more than just her blessings. Ruth's wonderful life teaches me that it is easy to be thankful when things go my way, but hard when people or circumstances fail to meet my expectations. Ruth wasn’t thankful just for her blessings, she was thankFULL for everything. She didn’t just count her blessings… she counted everything. I hear people complaining about traffic and long commutes all the time. Of course, Los Angeles traffic bothers me too at times. Yet, it was those hours in traffic that drove me to turn my car into a rolling university 25 years ago when I worked for Siemens. I've listened to thousands of hours of educational audio programs during long commutes, traffic jams, and airport delays. I attribute a significant portion of my “success” to my dedication to lifelong learning… in my car and elsewhere. I invite you to check out www.teach12.com and learn from the best teachers in the world. 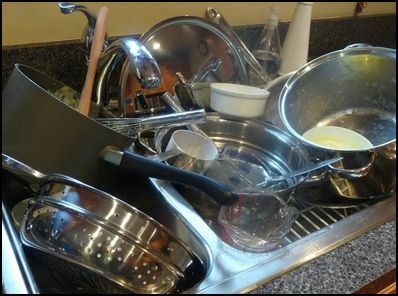 I used to hate washing dishes. My attitude changed one year when I realized that Ruth couldn't do the dishes because of her failing health. In that moment I decided that dirty dishes, especially during the holidays, represented an abundance of food, friends, and family. There are many who do not experience abundance during the holiday season. Those serving in our armed forces, suffering ill health, dying of hunger across the globe would do anything to wash dishes after a Thanksgiving meal. I encourage you to dirty a few extra dishes this holiday season by inviting someone who may have no place to go. The management of anxiety is the essence of growth. Nature, life, and research all teach us that hardship is critical to leadership. The ocean's reef is more spectacular on the side where the waves crash; those who fail to learn from difficulties are doomed to repeat them; eXtraordinary leaders understand that 70% of professional development occurs during challenging assignments. Our challenging economy continues to cause anxiety in many hearts and homes. I, too, was anxious when I lost two of my largest clients three years ago. I channeled my anxiety into positive energy by creating my new website (http://www.DaveJensenOnLeadership.com/), the eXpansive Leadership Model (XLM) assessment tool (http://xlmassessment.com/), and a first draft of my new leadership book. I am very thankful that these have been instrumental in the upswing in my business this year. It may be a stretch to say I am “thankful” for tough times, but it’s not a stretch to say that I choose to GROW through turbulent times instead of merely going through them. The holidays begin by giving thanks. I'm thankful that Ruth touched my heart. I am thankFULL that she taught me to count everything, not just my blessings. How about you? P.S. Dave Jensen transforms proven leadership tools into client success stories. Dave is an executive coach and an engaging speaker at conferences, meetings, and retreats. He can be reached in Los Angeles, CA at (310) 397-6686 or at http://davejensenonleadership.com/. Training Design Versus Development by Donald J. Ford, Ph.D., C.P.T. What’s the difference between an instructional designer and a course developer? This question came up during a recent search for a contractor to help one of my clients with a rush training project. I had asked which they needed and my question prompted the question above in response. It made me realize that many learning professionals don’t know the difference between the two. 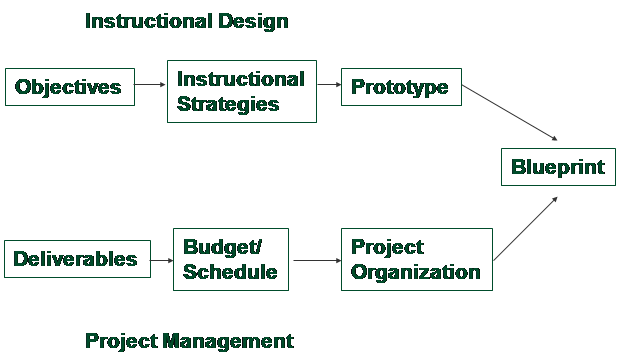 Although instructional design is generally considered a unified field of practice, it is really divided into two sub-disciplines: instructional design and material development. So what is the difference? The instructional designer is the architect of learning, creating a detailed blueprint based on a training needs assessment. The course developer takes the blueprint and constructs learning materials of all types – print, video, audio and combinations of all three – following the specifications created by the instructional designer, much like a general contractor builds a house following the architect’s detailed plan. To better understand these two roles, let’s consider the work that typically occurs in each of the “D” phases of ADDIE. 1. Specify the deliverables for the training, including all print, video and audio learning materials, plus any tests, exercises, pre-work and post-work assignments. 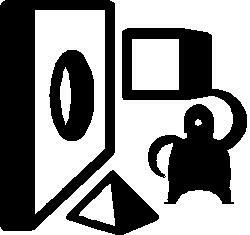 Typical e-learning deliverables are storyboards, video clips, audio narratives, graphics, photos and animations. 3. Lead project teams or assist in putting together the project organization that will design, develop and deliver the learning. All of these six tasks then merge in a training blueprint, a document that summarizes all the decisions made about the training. To get through this phase unscathed, it is essential to have a good plan of attack. This should start with a clear notion about the key components of the development phase of training. Here’s how they look in the development model below. Materials development occupies the most time in the process. Today, it often involves multiple specialists working together to achieve a common learning aim. For example, a technical writer may develop written content, a graphic artist may create and capture custom images, a videographer may record and edit video segments, a narrator may record audio tracks and a computer programmer may take all those materials and combine them in an online learning program that relies on an IT technician to load onto a Learning Management System. With so many different material developers at work, each dependent on the other for input, the detailed training blueprint design is the best way to keep all the moving pieces aligned. So, back to the first question – what is the main difference between instructional designers and course developers? Designers are experts at learning theory and at translating that theory into practical, effective plans for instruction. They are often also responsible for front-end analysis to ensure training meets business goals and the content is job-related. Developers are experts in translating training blueprints into learning objects, whether text, audio or video. They must be excellent at interpretation, writing, drawing, recording and editing the materials they are working with. They often use specialized computer software to help them accomplish their work. So, the next time you need help with a training design project, stop and consider what kind of help you really need. 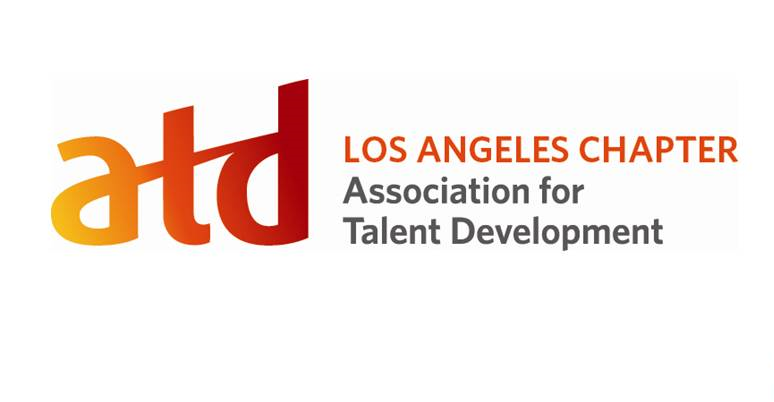 As many of you know, Terrence was a thought leader not only for the Los Angeles learning community, but throughout the world. He had a particular passion for social media as a tool for learning. We were lucky to have him as a regular contributor to our chapter newsletter. Here is the final article he wrote on the subject. Enjoy! “Build it and they will come.” This adage from the book Shoeless Joe by W.P. Kinsella may work for building magical baseball fields (or soccer fields for that matter), but it hardly works for most business applications. However, in its own right, it is a start. After all, if you don’t build it there is a guarantee: they won’t come. The same holds true for social media. The concept is hot in today’s business world but it is more involved than simply building a platform, opening access and expecting the masses to suddenly want to communicate and share. Building a social media community requires a strategy and a purpose. The activities we engage in while using social media are not new, unique, or dependent on technology. These activities are a part of being human and communal. As members of an organization with or without technology, we have been performing these now labeled “social media activities” since we uttered our first words (or grunts) as a species. The technology of social media makes the potential reach of our efforts exponential, unlike any other time in our history. Therein lies the true value of social media. Today, we can collect, share, collaborate, grow and engage our network with unprecedented speed and reach. A problem in a corporation can be experienced in China and solved in Brazil. A question can be posed in India and answered in Turkey. The intellectual capital of our communities is now captured and accessed via social media. Brian Solis, the author of Engage, calls social media “the redistribution of influence.” Traditionally, influence and information were centralized. As learning professionals, we held the keys to influence. If a manager wanted a training class, the training department would create it. If an employee needed an answer to an HR question, he would use his chain of command until the answer was found. In this structure all answers lead to the top of the pyramid, as if a deity or wizard were present at the highest level with all the answers. Although this system has worked for decades, that monopoly on influence is decaying and will soon be as ancient as the Egyptian pyramids. Influence is no longer exclusively in a hierarchal structure. With social media, it has transformed and we are all interlinked. Influence is based on one’s content and not position. People follow those with solutions and not titles (for the most part) in the social media realm. The advantage of this structure is that an employee is no longer limited to a chain of command structure but can search for answers to work challenges within the context of his extended network. The “chain of command” structure is limiting because the solutions are restricted to the intellectual capital of that command body. With Social media, the resources multiply exponentially as the network spreads throughout the organization and even beyond as firewall security is relaxed. People save time and discover abundant options. Therefore, our first point is, every organization should be developing a social media infrastructure for their employees, customers, and every stakeholder in the organization to share knowledge. If that hasn’t convinced you to use social media within your organization, here are ten additional points about why you should. Internet transparency allows you to hear what your employees and customers are saying about you but not to your face. Employees can access subject matter experts directly, saving time and money. The backchannel becomes a form of assessment, steering your organization to solutions. Employees become engaged and influential. Networks of collaboration form to solve organizational problems without guidance. Best practices spread exponentially across the organization or even industry. The organization has another option for sourcing potential new hires by witnessing their influence in the network. Training is no longer limited to the instructor’s knowledge, but now grows to include the intellectual capital of the community. Solutions are globally created and centrally catalogued. Intellectual capital is not lost with turnover. Once information is shared, it becomes the property of the community and the organization for future employees to use. This list can go on and on. Most would declare that social media is not a fad. Instead, social media is an integrated learning, communication, assessment, and team-building system. The catalogue of Social media tools is literally hundreds. To add relevance, let’s look at one of the most popular social media tools, Twitter. Twitter, Inc. defines its product Twitter as “a rich source of instant information.” Common perceptions about Twitter lead outsiders (non-users) to believe this social media tool is about people sharing irrelevant information like laundry dilemmas and gossip. Truth be told, there is a fair amount of useless information circulating the Twitterverse. But what else does that sound like? The Internet has an abundance of useless information dancing from server to server. Would anyone recommend they isolate themselves or their organization from the Internet? That’s not likely. Internet use is as common as most appliances these days. As savvy Internet users, we have learned to filter the Internet just like we did a newspaper, or a library for that matter. Not everything that is published is relevant to us at any given time. Therefore we filter what we want. Twitter is no different. Twitter is an amazing search engine as well. Sites like www.search.twitter.com can yield content as strong as a Google, Yahoo, or Bing search. The difference is Twitter doesn’t gather the information. Instead, it gathers users who share information. That information then becomes part of an extensive database everyone can access for free. Some of the information can be more useful than a traditional Internet search. For example, if you were wondering how your employees felt about a new compensation package, you would not be able to do a Google search to find that information. However, if you had a robust Social media network (like Twitter) in your organization, you would have a level of transparency that not even surveys contain. In addition to the transparency, you also get immediacy. The data are current, unsolicited, and typically authentic because of that transparency. How much would you pay for an assessment company to create a survey to do this same thing? Twitter is a platform for the learning professional as well. Since Twitter, the backchannel has become a well-established entity in many classrooms. This pipeline of informal dialogue adds another dimension to training events like seminars and conferences. At the recent ASTD International Conference and Exposition (or most large conferences for that matter), people used the backchannel to gather feedback about speakers before they joined a session or provide feedback to allow others to avoid being trapped in a session that wasn’t going well. Comments and links from many presentations were being shared and expanded upon by conference attendees and even those who were unable to attend. The network of users of this Backchannel even coordinated a “Tweet-up”, an informal gathering of Tweeters (a name for those using Twitter). Best Buy (electronics retailer) in the United States realized the potential of social immediacy and real-time feedback. They created Twelpforce (@twelpforce on Twitter). They saw a need to develop a stronger relationship with their customers. Best Buy empowered their tech support to unmask the corporate logo and simply go into the Twitterverse with their own identity and address customers’ concerns and problems. At the end of 2009, @twelpforce had provided 19,500 answers to customer questions. Additionally, every answer provided now has become part of a searchable database that everyone on Twitter can use. Perhaps the marketing aspect of the @twelpforce initiative is evident. But, at first glance, to HR professionals the usefulness may seem evasive. Depending on the size of your organization, your employees are talking about you on Twitter and other social media sites. Some use their own name, others whimsical usernames but many are giving you one of the most valuable gifts an employee can give you, feedback. The opportunity is for your organization to start listening. What could they be talking about? These are just a few. Many HR professionals have wondered what it would be like to be a fly on the wall by the water cooler where employees gather. With social media tools like Twitter, now you are that fly. You can hear what your employees are concerned about. This isn’t a license to abuse, though. Big Brother scenarios will cause a stampede out of a social network. Employees must be free to share without retribution or retaliation. Security should not be discounted but it doesn’t have to shut the door to social media in your organization either. IT’s concerns are legitimate and should be addressed. Employees need training on what is appropriate to discuss on open networks like Twitter. There are several Twitter-like platforms that are either password-protected or installed behind your firewall (Yammer.com is an example). If you have an email policy, you have a social media policy, or at least the start of one. Some could argue that email was one of the first social media tools along with the telephone. Emails can leak information just as easily as social media. I encourage and recommend consulting your IT and legal departments. You’ve been listening to an army of evangelists over the years touting the value of social media. The technology is very effective. However, the value of the site lies almost entirely with the community. First comes investing in the tools. Investing in the community is paramount. Content won’t show up magically. It has to be seeded and harvested through user engagement. You still must build it for them to come. Our challenging economy continues to cause anxiety in many hearts and homes. I too was anxious when I lost two of my largest clients three years ago. I channeled my anxiety into positive energy by creating my new website (http://www.DaveJensenOnLeadership.com/), the eXpansive Leadership Model (XLM) assessment tool (http://xlmassessment.com/), and a first draft of my new leadership book. I am very thankful that these have been instrumental in the upswing in my business this year. It may be a stretch to say I am “thankful” for tough times, but it’s not a stretch to say that I choose to GROW through turbulent times instead of merely going through them. Many professional trainers, consultants and coaches have built their careers on personal relationships, word of mouth and reputation. For those who have always depended on offline methods for reaching new clients, the new rules of marketing and business development may at first seem overwhelming. There are simply too many tools available, and no real roadmap for how to use them effectively. Without a solid plan, it's too easy to become preoccupied with technology like social media, video and webinars without first having a strategy for what type of content your market will value most. Facebook pages, Youtube channels and SlideShare accounts do little good if all they push out is generic, self-serving company “news” and sales pitches disguised as articles. By starting with the following basic model and rolling it out in manageable steps, you?ll have a strong infrastructure in place from which to share content that makes an impact with your audience and leads to new business. At the beginning, it's best to keep all the moving parts as simple as possible. Focus on what B2B marketer Eric Wittlake (b2bdigital.net) calls Stage Zero Content. What are all of the problems our expertise solves? Think high level problems, low level problems and everything in between. Who do we solve them for? How sophisticated and experienced is our target market with the solutions available? Content that?s valuable to one may be useless for another. What?s our content?s style and personality? The fatal flaw of most B2B marketing is the incorrect assumption that all business purchasing decisions are made purely by logic. This often leads to some pretty boring, bloated stuff. The best B2B content is written for human consumption and connects with us both emotionally and logically. Who will create our content? Everyone in your firm is a potential contributor of ideas and articles. Your sales, customer service and account management teams have the most day-to-day contact with your customers as well as intimate knowledge of the challenges they face. Your executive team understands big picture trends, opportunities and insights. By incorporating a broad range of perspectives, you?ll have a deeper understanding of the problems your readers face and the type of content they?ll find most useful. What topics should we write about? Close your eyes and pretend that you?re a fly on the wall, inside the offices of your ideal customer. What do you see and hear? How do they define the problems you solve? What type of information are they looking for? Your blog is the primary hub through which to share your content and begin attracting readers. Start by committing to at least one post every week, increasing that output as your editorial process evolves. The more quality content you publish, the sooner you?ll build an audience. Your blog should be easy to find from every page on your site, preferably with a dedicated link on the main menu. Don?t make visitors search for your content. Most won?t. Picture a B2B content marketing campaign as an ultra high-end retail store. If the internet is the sidewalk traffic, your blog is the window display that gets people to stop and look, and your first level follow-up offer entices them to walk into your store. End each blog post with a soft offer for more detailed content like a white paper, guide or e-book. There are two basic strategies for this step, and both have the same goal of creating opportunities for further engagement. You can offer additional resources in exchange for joining your email list or as an instant download with no sign up requirement, instead ending each piece with another strong call-to-action (Step 4). Now that you?ve engaged readers and earned some trust, your next call-to-action (through emails or at the end of your first offer) delivers even more value but in a more personalized, interactive way. By moving from highly convenient but static information to interactive, real-time content like webinars and seminars, you?ll begin conversations that help you learn more about each potential client?s needs and how to best serve them. Once you?ve set up your foundation of blog content and follow-up offers, you can begin to expand your reach by linking posts and offers to your company?s LinkedIn, Facebook and Twitter pages. Different readers have their own preferences for how they consume content. Some may like blogs, others Tweet or stick with Facebook. Many like a little of each. Each type of social media has its own quirks, processes and best practices and require consistent daily attention. While blog post comments make it possible to begin interacting with your audience, other social media platforms take it a step further and are best used as a conversational medium, not just a one-way syndication portal. Marcus Schaller is the author of The Lead Ladder-Turn Strangers into Clients, One Step at a Time (McGraw-Hill, 2006). He?s a contributor to various B2B publications including CMI, Brainshark.com and B2Bbloggers.com. Marcus can be reached at B2BforHumans.com or on Twitter @b2bforhumans. We had already biked 120 miles through Sequoia National Park in two days. I was shocked that my legs felt strong as we made the final push through 20 miles of hot, dusty, roads to our hotel in Exeter, CA. I took the lead to give my friend Mike a break. Two minutes later, he took the lead. I heard his labored breathing as I bolted by again, my resilient legs urging me to stay upfront for a while (and block the wind for him). But two minutes later, he passed me. This time, I started to move to the front after only a minute. He barked at me to stay back and let him do some of the work. I backed off, wondering why he was so upset. A few miles later, I found out. We stopped to refill our water bottles and have a “chat.” He explained that although he was dead tired, he needed to spend time in the lead. I told him my legs felt strong and that I didn’t mind doing most of the work at the front (thereby allowing him to draft behind). He replied that he didn't feel good about himself unless he was “contributing” by sharing the work. He then apologized for yelling (i.e., not expressing his emotion well) and I apologized for being clueless about his need to be at the front (i.e., not being more empathetic). How about you? How empathetic are you, especially you’re working hard? Leading researchers in the field of emotional intelligence have found that social intelligence, especially empathy, is critical to effective leadership. (1) High-level executives, hired for their strong self-discipline, drive, and intellect, often are fired because they lack social skills, especially empathy. Empathy is also critical when giving feedback to employees. Imagine if you had two groups that needed performance feedback. One group you give negative feedback, but you give positive emotional signals such as smiling and nodding during the session. To the second group, you provide positive feedback but deliver it with negative emotional signals such as frowns, wrinkled brows, and narrowed eyes. Research tells us that the people who received positive feedback with your negative emotional signals would feel worse about their performance than those who received negative feedback with a positive emotional delivery. How can you can be more empathetic when you need to deliver negative messages? Develop a personal vision for change. Write down the clear picture of the person you want to become, especially as it relates to being more empathetic. Undergo a thorough diagnostic assessment. Ask your Human Resource Department or e-mail me for information about assessing your emotional intelligence. Keep a log of your daily successes and failures. Use the log to help you notice when and how you practice new empathy behaviors. Work with a mentor. Identify someone at work who has excellent emotional intelligence skills. Ask them if you could work with them over the next several months to grow your skills. Leaders I coach often have an internal mentor at work also. A coach and mentor is a great one - two punch. Use daily reminders. Identify current habits that you can link to the new behaviors you want to augment. For example, if you take notes during meetings, you might write words at the top of your notepad to help remind you to be empathetic during meetings. Every time you looked down to scratch a note, you'll see your reminders. Reward yourself whenever you experience small progress using or growing your new skill. When I was an executive at UCLA, I rewarded my progress by walking to the cafeteria for a frozen yogurt, going out for lunch, or taking a mid-afternoon break. That which gets rewarded gets repeated. My friend and I finished our biking journey… and we are still friends because we are both committed to growing our emotional intelligence. How are you going to continue growing yours? 1. Daniel Goleman and Richard Boyatzis; Social Intelligence and the Biology of Leadership, ‘Harvard Business Review,’ September 2008, 74 - 81. The CEO marched to the podium. The applause faded. The audience of 500 senior executives and middle managers listened as the CEO outlined the major change initiative. Her grasp of the facts and details was amazing. Unfortunately, after 10 minutes of data, the audience drifted. The CEO lost them because she didn't know that broadcasting is not communicating. She didn't realize that to transform the mind one must go through the heart. This leader didn't appreciate the power of story to inspire, motivate, and encourage others to commit to her message. 1. A journey begins on common ground. The life experiences of your audience affect their ability to connect emotionally to any story. Familiarity helps an audience identify with the characters in your story. So, make sure your stories relate to their experiences. Begin on their turf so they know that you know where they are coming from. 2. Be true to you. Share who you are by letting the audience experience the emotion in your story. How? By feeling it yourself. They will feel it when you do. Therefore, you need to relive your story and its emotions as you tell it. This requires a degree of vulnerability that many leaders have a hard time exposing. I encourage you to try. 3. Keep them guessing. Professor Peter Gruber tells us “a great story is never fully predictable through foresight, but it is projectable through hindsight." It is how you reveal the nature of your characters, their difficulties, and how they overcome their obstacles that tantalize your audience. 4. Keep them engaged. Involve the audience by asking questions, adding humor, painting vivid pictures, and using the power of you. One of my favorite techniques is to put the audience in my stories. It's as easy as saying "imagine you're walking down the street..." You turn an ‘I’ story into a ‘we’ story. The whole audience experiences your story together. 5. Practice the paradox of presents. I strongly urge you to wing it when you present, BUT only after obsessively practicing. That's practicing the paradox of presents. It takes a lot of practice to appear unrehearsed. You practice, drill, and rehearse until you know your story inside and out. Then as you start telling the story, you become present with the audience. Be with them and they’ll go along with you. These are a few of the keys to telling effective stories. The CEO didn’t use them to move her audience. How can you adapt them move yours? Training Needs Assessment Versus Performance Analysis by Donald J. Ford, Ph.D., C.P.T. While training professionals have many ways to design and deliver learning, we all know that we should start the training process the same way – by analyzing the need. When presented with a potential training opportunity, we first must determine what has created this opportunity and how the organization should expend its resources to address it. In conducting an initial analysis, we have several decisions to make. First, we need to decide whether training is an appropriate solution. If it is, then we need to decide what content to include and finally, who needs to receive training. Each of these decisions can be supported by a growing number of models and tools that provide guidance and structure to our work. In particular, two models have emerged to guide our analysis – the Human Performance Improvement (HPI) model and the Training Needs Assessment (TNA) model. The HPI model refers to a systematic problem solving process that focuses on identifying root causes of complex performance problems and implementing systemic solutions. One of the key tenets of HPI philosophy is that we do not assume that training or any other particular solution is the answer to an organization’s problem until we have collected and analyzed evidence to support it. Another key tenet is that work performance is a complex system of attitudes, behaviors and accomplishments that depends upon both organizational and individual factors for success. 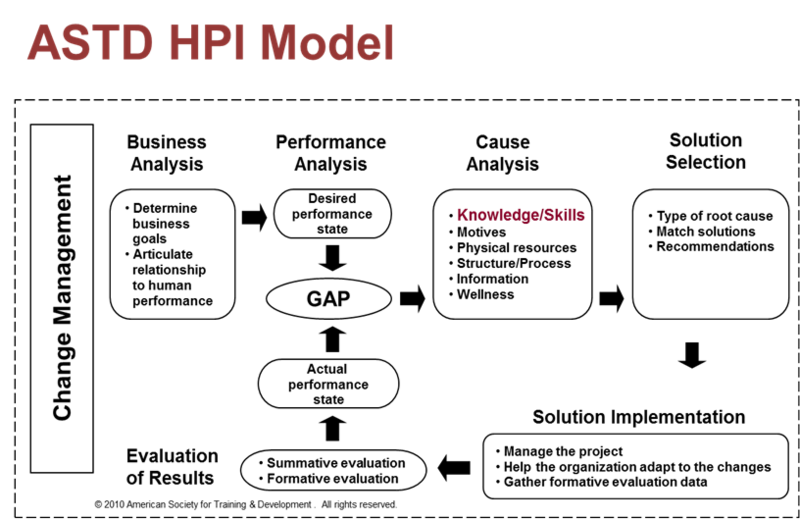 As the HPI model illustrates, performance analysis is divided into three phases – business, performance and cause. The business analysis determines the organization’s goals and how they relate to the performance of employees. This establishes the bottom-line results that we are trying to achieve. The performance analysis establishes the gap between where we are (actual state) and where we need to be (desired state). Finally, the cause analysis examines a variety of possible root causes to isolate those most likely creating the performance gap. Under cause analysis, note that knowledge/skills is only one of six key causes of performance problems. Unless we have evidence that a lack of knowledge or skill is contributing to the performance gap, we do not have a problem that training can solve. Put positively, we should only conduct training when we have evidence of a knowledge or skill gap. Providing training when the root cause is something else – lack of motivation, resources, structure, information or wellness – is just setting ourselves up for failure. 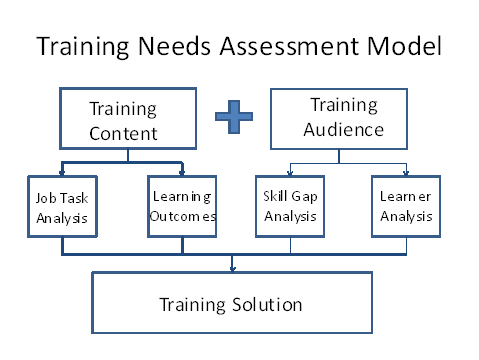 The model below shows how both of these key outcomes are created through a series of processes that lead to a fully-conceptualized training solution, the end product of training needs assessment. To understand how this works, consider the four boxes in the middle of the model. For content, we typically rely on two processes – job task analysis and establishing learning outcomes. Learning outcomes may be provided by the requesting client, key stakeholders or external mandates. We usually arrive at these through interviews and document review. 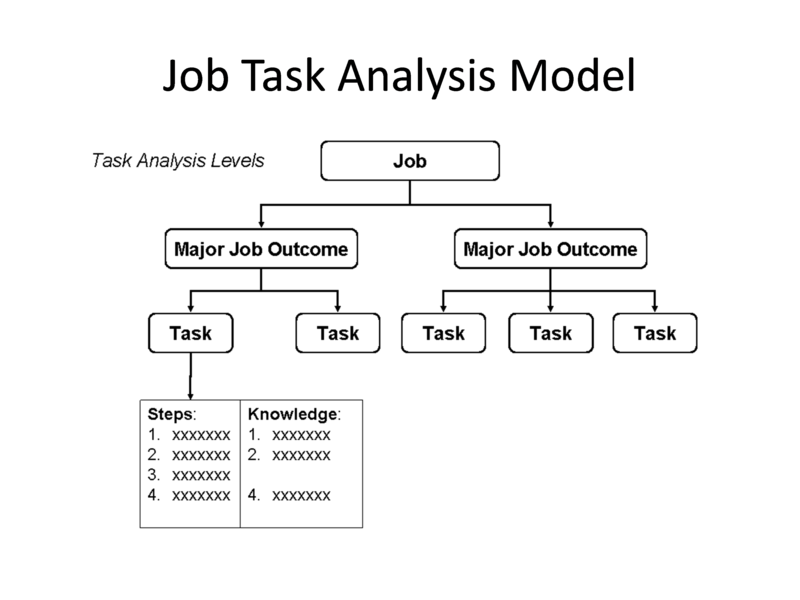 Job tasks analysis is a process that breaks jobs into outcomes, outcomes into tasks, tasks into steps, and steps into knowledge (see figure). Once we document these thoroughly through interviews and observation, we have the course domain. We can then match this up with the desired learning outcomes to determine the precise subject matter of the training. To analyze the training audience, we also rely on two key processes – skill gap analysis and learner analysis. Learner analysis is the process of defining the specific needs of the proposed target audience, including: prerequisite knowledge/skill levels, learning motivation, preferred learning styles, cultural differences, physical and environmental constraints, etc. This is often assembled through a combination of interviews and surveys. The skill gap analysis looks at the gap between the existing skill level of the target audience and the required skill level based on the organization’s needs and job standards. As a rule of thumb, the larger the skill gap, the more expensive and time-consuming is the training solution. 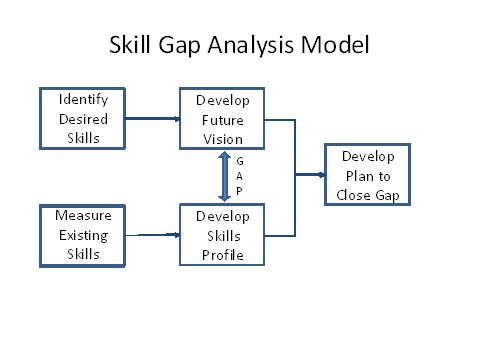 Skill gap analysis thus helps us estimate the time requirements while focusing on the highest priority content areas. Once we complete this analysis work, we are ready to assemble the pieces into a training solution that we take back to our client for approval. This takes us to the end of analysis. If we’ve done a good job, we will get approval to move to the next step – learning design. While we know how important analysis is to our process, clients often do not realize this. They may impatiently question why we are taking up their time analyzing the problem. They may wish to direct us to a solution without any analysis, relying on gut instinct. We will need to carefully explain the benefits of analysis in these cases or else risk seeing the process shortchanged or skipped altogether. One tactic that has worked for me is to use the analogy of a medical doctor. If you feel sick, but don’t know why, you expect your doctor to perform a diagnosis, complete with tests, prior to naming your illness and prescribing a plan of treatment. In fact, treatment without diagnosis is considered malpractice in the world of medicine. Likewise, if we provide treatment (training) without any diagnosis (analysis) we run the risk of professional malpractice. Although our treatments are rarely life-threatening (aside from the occasional death-by-PowerPoint), they do consume valuable time and resources at a moment when organizations can ill afford to waste either. The sun danced on the bed’s stainless steel rails as the late afternoon sun filtered through the blinds. The hospital orderly, a petite, Latina woman in her mid-50s placed her polishing cloth in the blue plastic bucket. Then, she calmed the wrinkled sheets with long, slow, smooth strokes. She picked her bucket and clipboard, checked a few items off her list, and then turned to speak with the bald woman in the other bed. I heard them laugh as I watched from the corridor. The orderly then walked out of the patient's room into the noisy corridor, and face-to-face with me. "Excuse me ma'am, may I ask you a question?" "Yes, of course," she smiled. "You do such a wonderful job here, what are you thinking as you clean these beds?" A broad smile spread across her face and lit up her big, brown eyes. Her machinegun response with a heavy dose of Spanish accent came straight at me. "My supervisor told me a long time ago to make up the patient's room thinking that the next patient going to be in the bed would be my mother." I returned her smile, "Thank you for making a difference to all the mothers in this hospital and their families." She thanked me for making her day and floated down the corridor. Motivation - the orderly’s supervisor knew how to inspire her people. Depth – you can’t have a great organization without developing great leaders at all levels. Rewards – leaders must take the time to provide positive feedback. Defines leadership – the supervisor’s action define the leader’s job. "Leadership is the process of unleashing the energy of people toward worthy goals." A third leadership question that arises when I tell the above story is this: Are we talking about management or leadership? When I worked for the global giant Siemens many years ago, I reported to a boss who thought he was leading us, but Don was only managing us. Don seldom inspired strategic thinking, innovation or cross-functional collaboration. He was always focused on expense reports, detailed plans and objectives. An illuminating lunch with Peter Drucker years after I left Siemens helped me understand that the best leaders are also great managers and vice versa. The purpose of my luncheon meeting with management guru Peter Drucker, whom Harvard Business Review considers the “father of management,” was to discuss the overall strategy and future of a new organization we were building at UCLA (where I was an executive). After soaring with Professor Drucker’s illuminating ideas, I found myself back in my office tethered to the details of the day - reviewing budget details. These two experiences summed up my responsibilities as the chief administrative officer of this organization. One minute I was thinking big picture and developing long-term goals, the next I was clarifying objectives and managing operations. I was answering YES to the question, am I a leader or a manager? Exceptional leaders have been answering yes for years. How often do you find yourself engaged in what some call “leadership” activities, such as developing long-term goals or strategies, collaborating with others across divisions or departments, inspiring change or innovation among your team members? Do you also engage in what many would label traditional “management” behaviors, such as clarifying objectives and expectations, developing plans, managing operations, or monitoring your environment? Whether you consider yourself a leader or a manager, success in today's flat, complex and interdependent work environment demands that you use the complementary skills of both. Of course, there is a difference regarding the amount, nature, and exact mix of these skills depending on your level of responsibility in the organization. Yet, wasn’t the orderly’s supervisor acting like a leader when she inspired the orderly toward a worthy goal? Moreover, what about the hospital’s CEO? Doesn’t he or she need to manage budgets and operations in order to accomplish the hospital’s goals? Science answers yes. After reviewing approximately 1,300 scientific studies on leadership in his comprehensive book, Professor Gary Yukl concluded that, "most scholars seem to agree that success as a manager or administrator in modern organizations necessarily involves leading." (3) To which I add; success as a leader also involves managing. Next time someone asks you if you are a leader or manager, just say YES! Then tell them a story about the orderly’s supervisor who inspired her team with a vision of a very clean operation. 1. Cited in Yukl, Gary; Leadership in Organizations, Prentice Hall, Upper Saddle River, New Jersey, 2006, Page 2. 3. Yukl, Gary; Leadership in Organizations, Prentice Hall, Upper Saddle River, New Jersey, 2006, page 6. "Learning from the Learner’s Perspective" by Donald J. Ford, Ph.D.
As training professionals, we are accustomed to leading and facilitating learning for others. In this role, we sometimes forget to look at learning from the learner's perspective. It is useful for us to put ourselves in the learner’s seat from time to time to better understand the learning process. 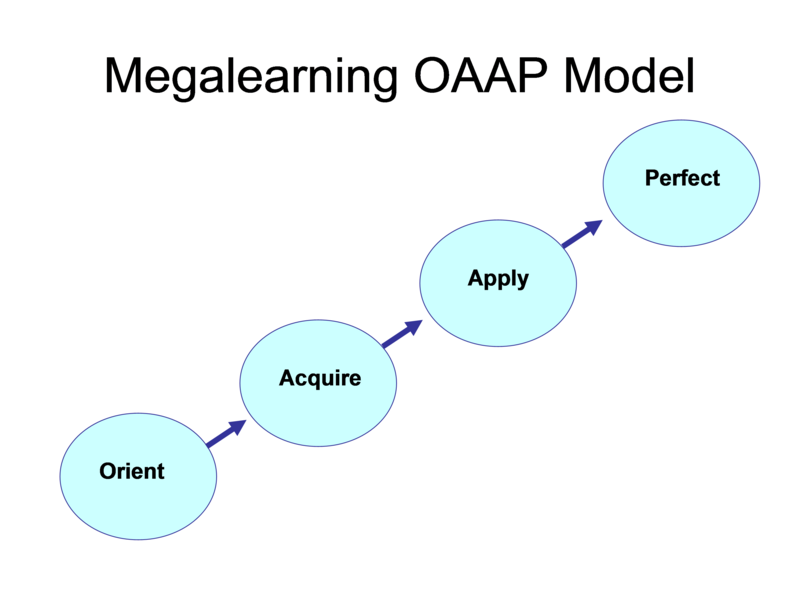 Orient –identify what we want to learn and the reasons that learning will benefit us. Acquire – actively seek new knowledge and skill through our own efforts and the assistance of others, such as teachers or significant people in our lives. Apply – discover ways to use the newly acquired knowledge in the course of our daily lives. Perfect – continue to hone our knowledge through practice, evaluation, and continuous improvement. The first phase of learning, orient, involves identifying the new knowledge and skills that we need and why acquiring it will benefit us. So much in our complex world is unknown that our first challenge is simply to identify what we don’t know. Identifying what we don't know is further complicated by our natural blind spots. We literally don’t know what we don’t know. Our lack of knowledge and blind spots often prevent us from understanding what is happening and how it affects us. Once we have broken through our blinders and identified a subject that we don’t know about, the next step is to find a compelling reason to expend and sustain the effort required to learn. Learning is hard work, make no mistake about that. The brain expends an enormous amount of energy when learning. We literally can get a headache from the concentrated effort required to learn a difficult subject. Whatever the reason, we need to find something to motivate us to learn, to sustain the difficult process of acquiring and perfecting new knowledge and skill. This motivation needs to inspire for the short term reward, as well as the long learning journey ahead and the final result. The best forms of learning motivation contain both extrinsic rewards, like better pay and more social cachet; and intrinsic rewards, like self-improvement and inner satisfaction. It helps to explicitly identify the reasons to learn something new and to keep these purposes firmly in mind as we embark upon learning. Preferred learning style and sensory preferences – how do you like to learn? Sources of expertise and the availability of these experts to teach you – who will guide your learning? Effort required - how much time and cost to acquire the new knowledge and what will it take to succeed? The third phase of learning, apply, is using what we learn in our daily lives. We are capable of learning many things, but we are also capable of forgetting most of it. Think back to the subjects you studied at school. If someone gave you a test on those subjects today, how well would you do? Most of us would fail miserably, because we haven’t used that school knowledge in so many years that we have forgotten it. A key principle of learning is “use it or lose it.” Experts suggest that if we do not use newly acquired skills within 21 days, we will forget them and have to start over again. In fact, some studies suggest that we forget most of what we learn within 24 hours. For example, think about the last time you tried learning a new software program. How much of what you learned were you able to retain? Chances are, you remembered only the skills that you actually used on the job and you became truly proficient in only those parts of the software that you use it daily. In fact, experts have estimated that most people use only about 10 percent of the total features of today’s software programs. When it comes to applying learning, several things are known to help. First, start applying immediately. The sooner we apply what we learn, the more likely it will stick. In formal training and education courses, application begins in the class during practice activities and after class completing homework assignments. If well-crafted, practice can reinforce learning and help us move it into our permanent memory banks for future retrieval when needed. Second, after the learning has occurred, discover new ways to use the knowledge in your daily life. Begin to practice new skills immediately in the most obvious setting where you need them. Then go beyond the obvious and look for novel ways to apply the learning in a variety of situations. The final phase of learning, to perfect new knowledge and skill, is achieved through ongoing practice, evaluation, and continuous improvement. 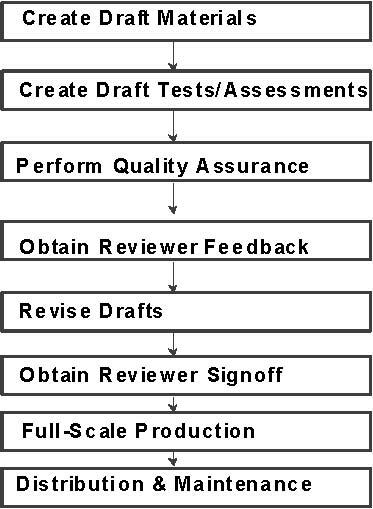 This last phase is how we develop expertise in a subject over the long haul. Of course, not all learning requires perfection. Sometimes, being an amateur or a layman is sufficient. So we first need to decide which areas of learning require us to become experts. These are typically areas of knowledge that are crucial to our careers or of abiding personal interest to us due to the intrinsic appeal of the subject matter. The first principle of perfection is “practice makes perfect.” The more we practice and use knowledge, the more we perfect our ability to apply it. But legendary football coach Vince Lombardi once commented that the role of practice was misunderstood. It is not “practice makes perfect,” according to Lombardi, but “perfect practice makes perfect.” By that remark he meant that how we practice makes a huge difference in the results we achieve. If we practice the wrong way or practice our mistakes, we don’t get better. Instead, we get worse. So, Lombardi emphasized to his players the vital importance of practicing perfectly, of doing in practice exactly what you were expected to do in the game, as the basis of long term learning and success. Videotaping your practice and watching it later, if it is an observable skill. Having a third party evaluate your practice and provide feedback, such as a coach. Asking trusted people to provide honest feedback about your practice, such as family and close friends. Taking a test or assessment of some kind to demonstrate your knowledge and skill. However you acquire evaluation input, remember the second key principle: it is important to receive feedback and evaluation openly and with a spirit of continuous improvement. Confirm that the feedback is accurate. Commit yourself to continuously improving your knowledge and skills throughout your life. Look for incremental opportunities to improve and look for big breakthroughs as well. Above all, pay close attention to sources of information that you trust that can tell you how you are doing. Keep an open mind and continue to try to improve yourself through more learning, more practice, and more evaluation. This is the ultimate secret to success in learning and success in life. Those who succeed never give up and never close their minds to the possibility of improving themselves.